Soon after being named Entrepreneur of the Year in Zimbabwe’s equivalent of “Dragon’s Den”, Daniel Mugandiri was faced with the challenge of turning his business idea into reality. The 26-year-old wanted to manufacture solar panels to help address the nation’s electricity shortage. He wasn’t certain how to go about it, but he knew where to start. Mugandiri didn’t have any Chinese contacts, so he decided to write a letter to the Chinese ambassador in Harare. A few days later, he got a call from the embassy. Less than two months after that, he had joined a fully-funded three-month programme for young entrepreneurs in south eastern China. Mugandiri was one of 25 participants from developing countries who visited universities and factories in Fujian Province, and met several Chinese businesspeople. He returned to Harare, determined to find business partners in China. But he was also acutely aware of language barriers. “I realised that if I do go back to China to learn how to manufacture solar tiles, Chinese language is another challenge,” he says. Mugandiri searched online and came across the Confucius Institute (CI) at the University of Zimbabwe. He enrolled in evening classes in Mandarin for a nominal fee. The institute Mugandiri attended is one of over 500 Chinese language and culture centres around the world, overseen by an arm of China’s Ministry of Education known as Hanban. While accusations of spying, propaganda and censorship at CIs recently reached new heights in Australia and the US, in Africa the organisations have largely been welcomed with open arms. There are now almost fifty on the continent, and counting, catering to the fast-growing demand for Mandarin lessons. Around 400 adults take classes at the CI in Harare every semester, instructed by a staff that comprises an equal number of Chinese and Zimbabwean teachers. “More people speak Chinese than any other language; if I can speak to the majority of the world’s people, I can support or disagree neatly with more people,” says one student. “Considering Zimbabwe is now trading immensely with China, knowing their language will break down communication barriers when conducting business,” adds another. For many in Africa, China has become synonymous with economic success and the ability to speak Mandarin is seen as a sure-fire route to lucrative opportunities. Over in Tanzania, for instance, Amjad Fakih was one of many ambitious citizens who lined up to learn the language at a CI in Dar es Salaam, hoping to capitalise. Hanban has stepped up its deployment of volunteers and teachers in Tanzania, supported by the East African government, which is eager to foster bilateral cooperation. 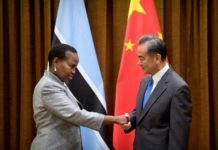 Speaking at the launch of a pilot programme in Dar es Salaam in February 2016, a Tanzanian Education Ministry official urged citizens to learn Mandarin. “If you learn Chinese language and culture well, you will also acquire the technological knowledge and skills of the Chinese who are very successful in this area,” he said. Beyond universities, Hanban has been pushing language courses in Tanzanian primary and secondary schools, while the Muslim University of Morogoro hosted a CI-run language programme for officials from Tanzania’s Immigration Department and Police Force. Chinese is now a key language in 14 secondary schools across Tanzania, five years after the country’s first CI opened in Dodoma. With relations between China and Tanzania quickly growing both politically and economically, Fakih figured that he couldn’t afford not to learn Mandarin. “When something is new in the market, demand will come,” he says. 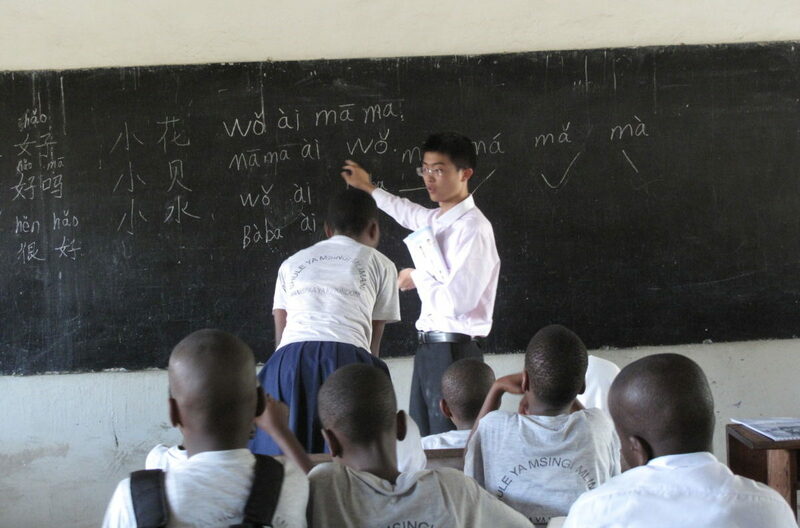 For Africans wishing to learn Chinese, enrolling in lessons at home is not the only route. There is a fast-growing group of African students studying at universities in China itself. In fact, as of 2017, China is the most popular destination for English-speaking Africans to study abroad, overtaking the US and UK. Some students fund their own courses, but many others are supported by Chinese state scholarships. These have increased in number with demand, and Beijing has set a target of awarding 30,000 scholarships to African students by the end of this year. The promise of scholarships provides an ongoing source of motivation for Mandarin students around the continent. Those who pass an intermediate level Chinese proficiency test qualify for a fully-funded Chinese language scholarship at a university in China for up to a year. Teachers at CIs remind students of this constantly. 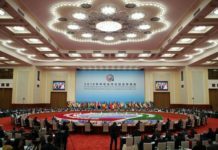 Beijing’s sweeping Mandarin drive is still in its infancy; the very first CI was established as recently as 2004 in Seoul. But in Africa, the pace at which Chinese courses are being introduced and students are enrolling is accelerating. This trend is driven by high expectations of what speaking Mandarin will bring, but the reality is often more difficult than some would hope. Back in Zimbabwe, Mugandiri is still looking for Chinese business partners, and his visits to China have only impressed on him how long his journey to fluency will be. “I haven’t got connections yet for solar roofing tile manufacturing companies in China, but I am still pushing,” he says. Others, however, have had more immediate success. Terana Nyumba learnt Chinese during three years in north eastern China. When he returned to his home in Zambia, he tried to tap into Lusaka’s Chinese business community and quickly picked up some informal translation jobs. Nyumba does express some caution. “When you talk about anything to do with China, you have to talk about the state. And every institution and business firm eventually submits to its ideology,” he says. This is an apt point that is regularly raised in African cities. Chinese may well become indispensable; it may leave those who don’t learn it behind, as Beijing would have the world believe. 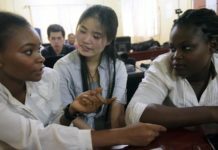 But, as growing numbers of African students enrol in Mandarin courses, it seems that, either way, Chinese is already well on its way to finding a place among the assortment of lingua franca that calls Africa home.